There’s nothing quite like frigid temperatures to remind you that, yes, it is once again time to harvest KOZO in Philadelphia. What exactly is KOZO, you ask? Well it’s the Japanese word referring to the Paper Mulberry (broussonetia papyrifera). While Philadelphia already has two varieties of (non)native mulberry — the red and the white — the Paper Mulberry is a distant relative to these trees, is quite invasive, and has claimed broken sidewalks, empty lots and out-of-use industrial sites throughout the city. I’ve spotted it in South Philadelphia, West Philadelphia (notably surrounding Bartram’s Garden, John Bartram being the man who *first* brought the plant to Philadelphia), and as far north as the abandoned piers on the Delaware River. Yes, the Paper Mulberry grows nearly everywhere, and in winter, once the plant has gone dormant, it’s time to harvest the young branches. This does not kill the plant, and in fact, you can cut the branches down to the base of the plant, and it will regenerate new branches at a suitable size for harvest the following season as well, for 3 to 5 seasons. 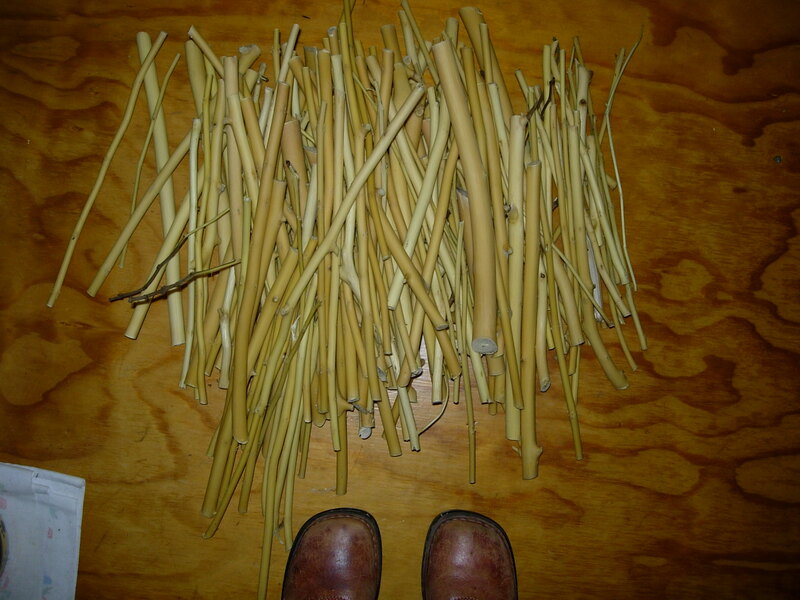 While I did not take photographs where I harvested the branches, I do have photographs of the first batch of partially processed fiber. Pile of steamed kozo fiber on my kitchen counter. These are the cleaned mulberry branches after steaming. 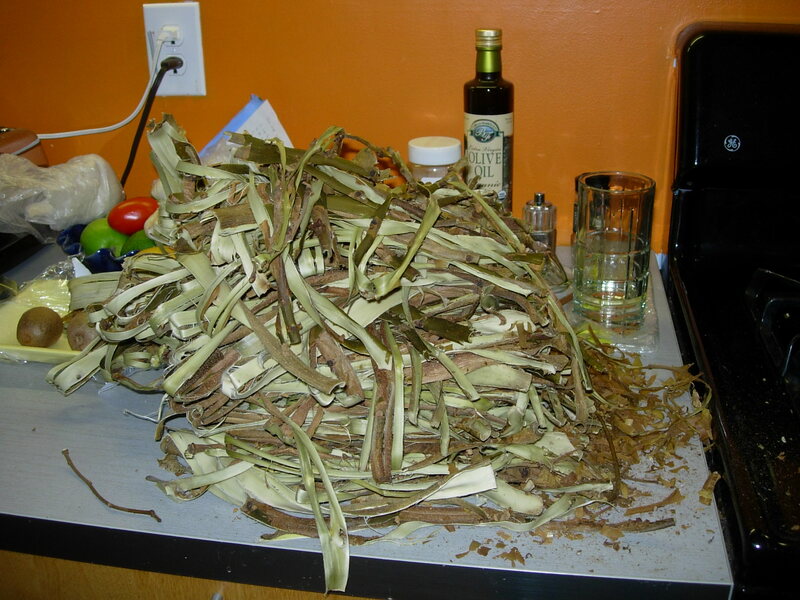 Remove the outer bark; cook the fiber with an alkaline; rinse the fiber; hand beat the fiber using mallets; add the fiber to a vat of water with formation aid, AND START MAKING PAPER!